Long marketed to Melburnians as a winter escape to sunshine, Mildura, on the banks of the River Murray, is one of Australia’s most notable river towns. Massive irrigation works from the late 1880s were the basis of a vast fruit industry, including drying and preserving. The early reliance on river boats was overtaken by the railway connection to Melbourne, 475 km away, in 1903. By the 1930s Mildura and the surrounding area produced more than half of all Australia’s dried fruit. The population doubled between 1961 and 1991, just shy of 24,000, but since then has only risen gradually. Motels, holiday apartments and caravan parks cater for the holiday makers, while the Grand Hotel, of classic interwar proportions, remains a commanding physical and gastronomic presence. Mildura is a provincial city on the River Murray in north-west Victoria. It is 475 km north-west of Melbourne, via the Sunraysia Highway. The Mildura area is in the Mallee region. It was occupied as a pastoral run in 1847. Named Irymple, the run was renamed Mildura in 1858. The name is thought to have derived from an Aboriginal word meaning sore eyes caused by flies, or red rock. The Anglican Yelta Mission (1855) west of Mildura had been established as one of seven Aboriginal reserves in the colony by 1863. The Anglican Mission on the Murray-Darling junction was established by missionaries Goodwin and John Bulmer. It was visited by the Lower Murray people who according to Richard Broome, were 'encouraged by an initial supply of government rations, helped to form huts, a school, fences and gardens, but the experience paled alongside working for wages on surrounding stations'. In late 1866 Yelta was scaled down and closed in 1869. During the 1870s severe drought reduced the sheep-carrying capacity of the Mallee runs, and neglect and undergrazing led to rabbit invasions. While the land fell into ruin, social reformers agitated for closer-settlement farmlands. The potentially rich Mallee soils offered scope for their objectives, and nascent irrigation works elsewhere in Victoria suggested a way forward. 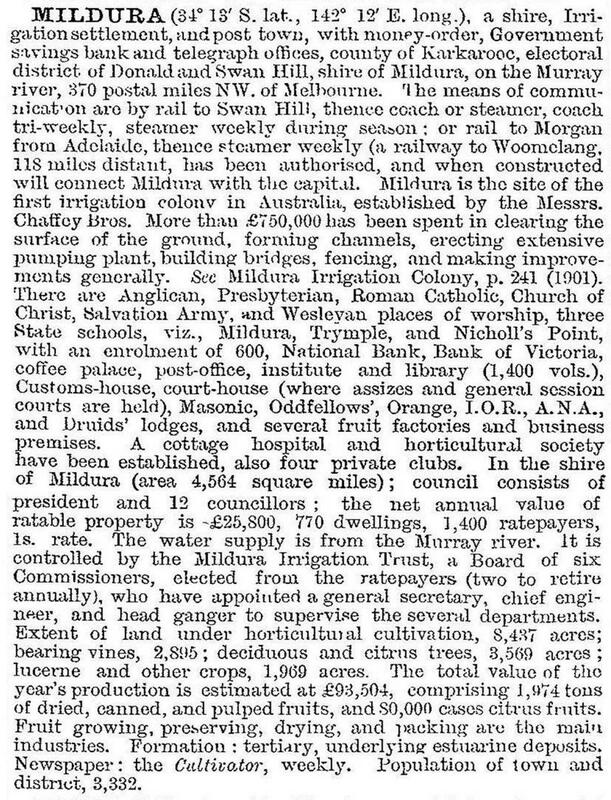 In 1884 the Victoria Government had a royal commission on irrigation, chaired by Alfred Deakin. Later in the year Deakin led a party to investigate irrigation in California, where he met the Canadian irrigationists, the Chaffey brothers. In 1886 the Chaffeys demonstrated their irrigation methods at Mildura, after inspecting the fertile gardens at the Mildura homestead which were irrigated by river water. In 1887 the Chaffey brothers and the Government entered into an agreement granting the Chaffeys up to 1012 sq km of land, subject to their establishing an irrigation settlement with pumping plants, channels, roads etc over 20 years. An agricultural college was to be formed, farm allotments were not to exceed 32 ha (fruit) or 65 ha (general produce), and fruit-drying and preserving industries were to be established. By 1890 a township of 405 ha was three-quarters sold. There were a government school (1888), Methodist and Anglican churches (1888), several shops, two bank branches, a coffee palace, but no hotel as Mildura was to remain a ‘dry’ area until 1920. Langtree Hall in Walnut Street also dates from these years. There were three pumping stations (Psyche, Billabong and Nichols Point, 1889), ice-making, cool storage, a sawmill and three newspapers. On 10 January 1890 the Mildura shire was formed by severance from Swan Hill shire, and its census population the following year was 2235. In the 1890s a cottage hospital (1892), the Settlers’ Club (1893) and the Working Men’s Club (1894) were established. Dried fruits were Mildura’s leading product, and in 1907 the Mildura Fruit Growers’ Association (1891) merged with its Renmark counterpart to form the Australian Dried Fruits Association. Settlement at Merbein, 10 km west of Mildura, began in 1909, and soldier-settlement farms were first taken up in 1917. Settlement at Red Cliffs, south of Mildura, began in 1923. The railway line was extended westwards to Yelta in 1925. Town amenities were steadily added to Mildura: a Carnegie library (1907), an urban water trust (1909) and a high school (1913). On 18 May 1920, the Mildura riding of Mildura shire was severed and made a borough. It became a town in 1922 and a city on 21 March 1934. Mildura’s long-standing newspaper, the Sunraysia Daily, was established in 1920 by Clement John De Garis, financier, dried-fruits enthusiast and son of Elisha De Garis. Elisha had encouraged Deakin to visit the Chaffeys. As well as the Sunraysia Daily, Mildura threw off its temperance origins in 1920 by the Coffee Palace gaining a licence and becoming the Grand Hotel. The ban on alcohol had originated with the Chaffeys who had established their first irrigation town, Ontario, 60 km west of Los Angeles, California, in 1882. The Chaffeys had seen the scourge of alcohol in the western American states, and the Methodist community in Mildura (Elisha De Garis was a Methodist minister) would have supported their stance in Australia. Ontario, California, was named after the Chaffeys’ Canadian birthplace, and there is an Ontario Avenue in Mildura near William Chaffey’s Rio Vista homestead. The main street of Ontario, Euclid Avenue, resembles Deakin Avenue, Mildura, and it has been planted with eucalypts for shade from the hot Californian sun. In 1928 the Mildura lock and weir at Lock Island in the Murray River were completed. Designed by John Dethridge of the State Rivers and Water Supply Commission, it aided navigation and formed a raised pool from which irrigation water is more readily pumped. The pumping plant (1921-22), the largest in the southern hemisphere, drew 500 acre feet per day. In 1934-35 the Mildura irrigation area had 4730 ha and 640 km of channels. Urban population was 4000 and rural population 6610. Dried fruit production for Mildura, Merbein and Red Cliffs was 54% of the Australian total. Sultanas were 68% of the district’s 34,320 tons of dried fruits. Citrus, fresh grapes, stone fruit, peas and butter were also produced. Ever since the first years of irrigation poor drainage and salinity had troubled fruit growers. Drainage shafts into porous subsoil had alleviated the problem until silting gradually reduced their effectiveness. In 1924 a gravitational outfall was constructed by the State Rivers and Water Supply Commission, and the work was intensified during the 1930s. A consequence has been increasing salinity of the Murray River. The University of Melbourne established a Mildura campus (1947-49), mainly for ex-War service personnel. The Sunraysia Daily’s proprietor, R.D. Elliott, donated an art collection to the municipality, and in 1955 Chaffey’s Rio Vista homestead was acquired and converted to a gallery. The Daily also sent its chief-of-staff to central Australia and Queensland in 1954 to study tourism. He reported that Mildura’s sunshine, particularly in winter, made it a potential tourist resort. Two Hungarian brothers, the Sandors, built a motel in Eighth Street in the mid-1950s. 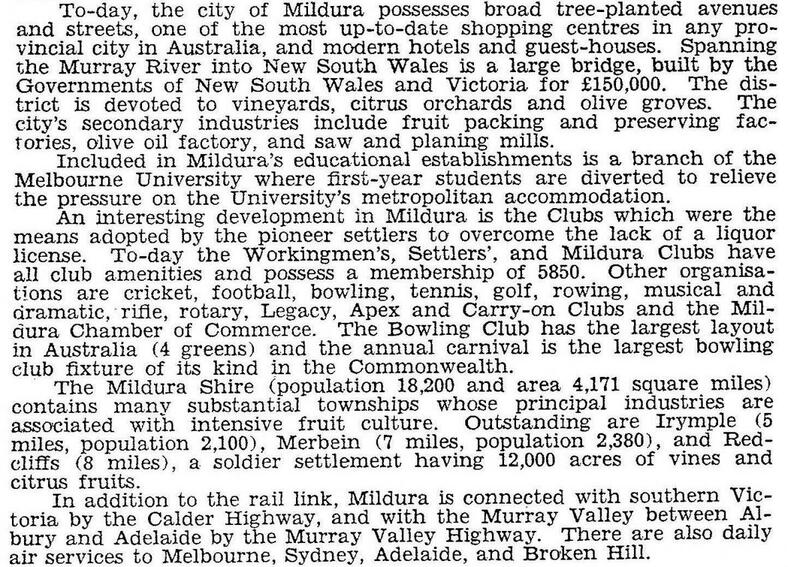 Within 30 years Mildura had 22 motels, 19 units of holiday flats and 11 caravan parks. In 1995 Mildura city had 2759 hotel/motel bed spaces. 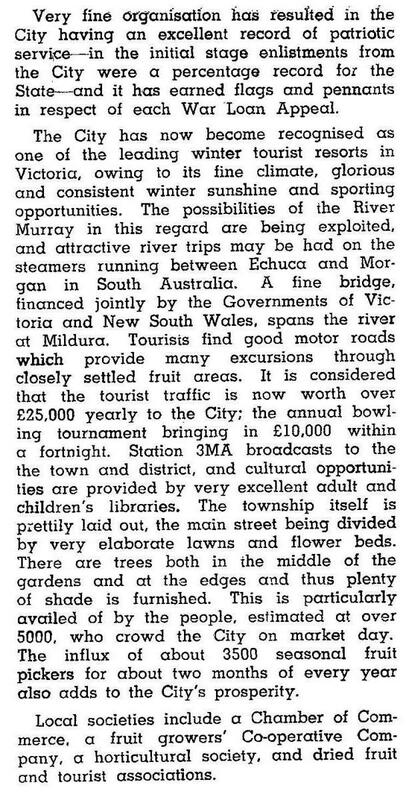 Numerous other holiday attractions, and paddle steamers operating from the Mildura wharf, had been developed. An arts centre was opened beside Rio Vista in 1966 in parkland settings beside the river. The replica Mildura Homestead and the Workingman’s Club (once with the world’s longest bar) are local places of note. West of the city there are a golf course and a reserve with soccer, basketball, tennis and baseball facilities. The showground is towards the east of the city and the racecourse is 3 km eastwards at Nichols Point. Langtree and Deakin Avenues have strong retailing strips, and Mildura Centro (1982, two discount department stores and 73 other shops) is southwards on the city’s edge. In 1986 Mildura city’s total retail area was 70,800 sq km, five times greater than surrounding Mildura shires. There are a LaTrobe University campus, Sunraysia TAFE, secondary schools and State and denominational primary schools. Medical services included Mildura Base Hospital and two private hospitals, and most church denominations are represented. The Mildura Base Hospital was sold in 2014 for conversion to serviced apartments and a conference centre. The city’s outskirts are flanked with citrus orchards and vineyards, and the Mildura Co-op Fruit Company and packing shed adjoin the railway line. The line has carried only freight since 1993. The annual country music festival is held in September. 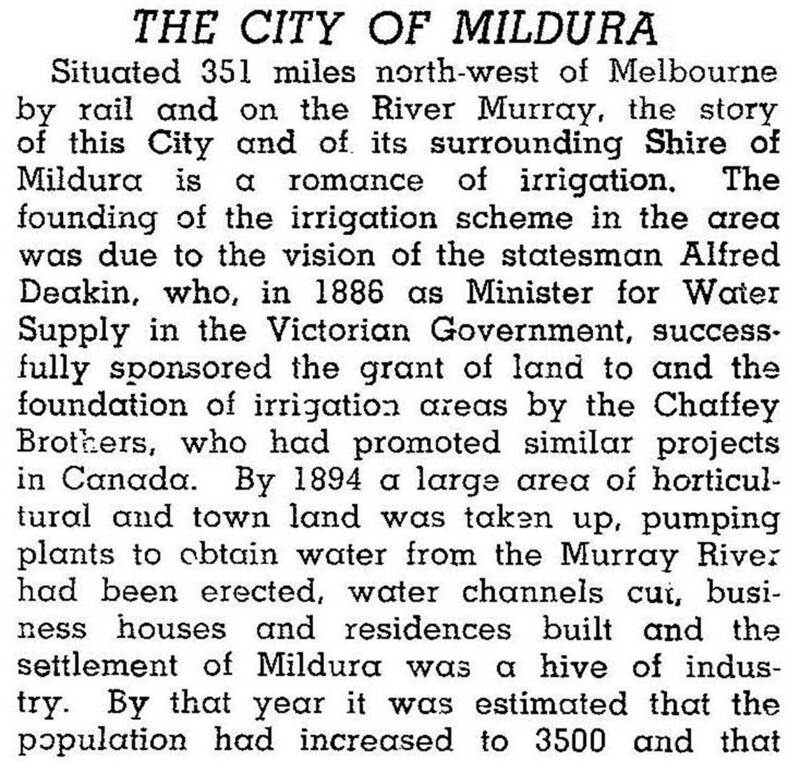 On 20 January 1995, Mildura city was united with Mildura shire and part of Walpeup shire to form Mildura Rural City. The Rural City’s census population in 1996 was 45,418, of which about 40,600 people were in Menbein-Mildura-Red Cliffs.